I am delighted to be able to say that my new book Hanging on to the Edges is now published. Thanks to Open Book Publishers, it’s an open access book; you can read it online, download the PDF, or order paper copies here. People often ask me what Hanging on to the Edges is about, and it is not entirely easy to say. It is based on fourteen blog essays I published on this site over the past two years, though they are revised and re-ordered in the book version. 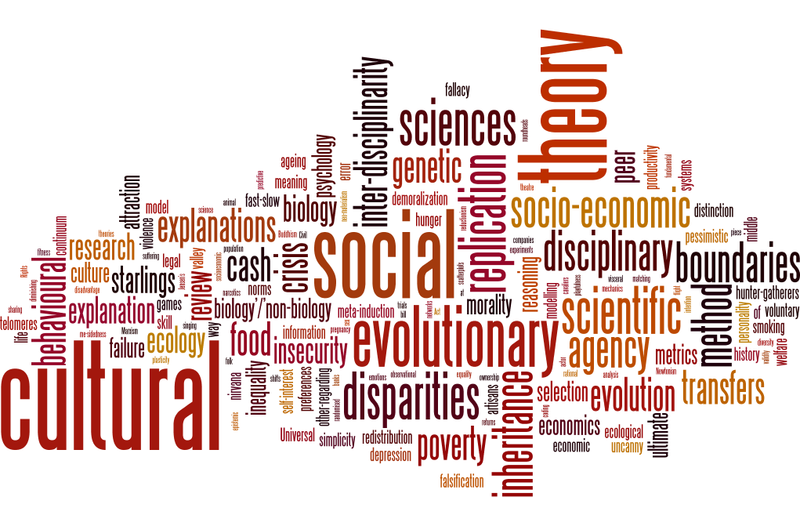 It is an attempt to reflect on the major things I care about most in life: science and being a scientist; human nature and human cognition; the relationship between the social and the biological; inter-disciplinarity; politics; and human well-being. We are delighted to announce that Blue/Orange will play in Durham on Tuesday March 21st 2017, at 19:30pm, at the Empty Shop HQ in Framwellgate Bridge, DH1 4SJ. Tickets are available from here. This simple space is going to be wonderful for the piece. I like productions where I can carry the set down with me on the train. And don’t forget, of course, performances in Newcastle on the Friday and Saturday of the same week, at Northern Stage. 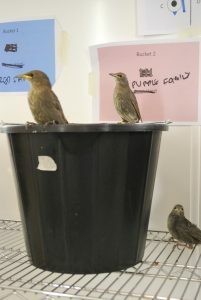 We’ve just published a new paper on the effects of early-life adversity in starlings. We are particularly interested in how early adversity affects the shortening of telomeres. Telomeres are the protective DNA caps on the ends of our (and their) chromosomes, whose length is often used as a marker of biological age. We have found previously that nestlings who are smaller than their brood mates lose telomeres faster in the first few weeks of life. A bad start ages you. However, we didn’t know what it is about being at a disadvantage in the brood that accelerates telomere loss. Is it that you don’t get so much to eat? Or is it the stress of having to struggle and beg more to hold your own when those around you are bigger and stronger? Or a bit of both? We decided to test this in a hand-rearing experiment. Here, we would play the parents and thus decide what each bird experienced in its formative days. Many collaborators contributed to this study. We took four siblings from each of eight wild broods. From each family, one sibling was fed all it wanted nine times a day; a second was fed nine times a day but only 70% of what the first sibling got; the third was fed all it wanted nine times a day but had to do an additional 18 minutes a day of begging; and the fourth, who had it toughest of all, received 70% of what the third sibling did, and also did the extra begging. 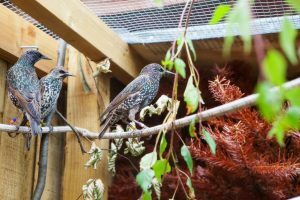 The birds all survived – in fact these adversities are well within the natural range of what a wild starling might experience. 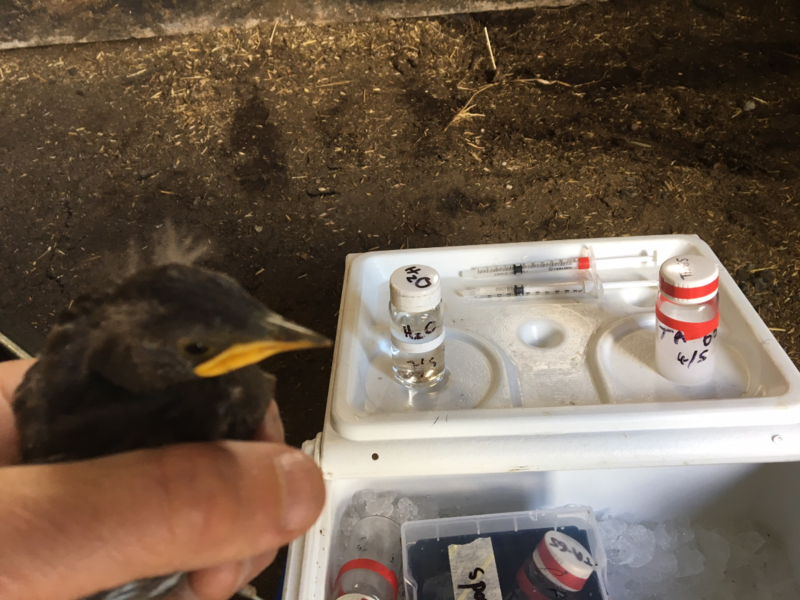 Though they all fledged into normal adult birds, we found a difference in their telomeres (in red blood cells) when they were two months old. The more adversity we had given them, the greater the magnitude of their telomere shortening over their early life. 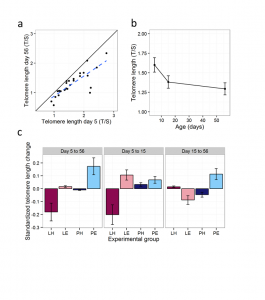 Everyone’s telomeres get shorter in this period anyway, since a lot of cell division is going on, but the birds with more adversity showed more shortening. It seems that both the amount you get to eat, and the amount you have to struggle for it, both affect the pace of your cellular ageing, and do so additively (that is, if you have both adversities, it’s worse than having either one alone). This is important, since we know in both mammals and birds that conditions experienced in early life can affect survival. Cellular ageing might point to a mechanism by which this could occur. We also made some other curious observations. The birds showed some differences in adult inflammation according to their developmental histories, but some combinations of adversity increased adult inflammation, whilst others reduced it. Birds that had had little food, but not had to beg for it, went on to become relatively obese as juveniles (which is interesting given the links between childhood stress and obesity in humans), but birds that had had little food and had to beg for it remained lean. Thus, it looks like early-life experience matters for your biology as an adult, but it matters in complex ways, not as simple as saying ‘more early-life adversity = more adult problems’. We are used to the idea that the poor behave in a certain way- living for the day, devil may care, fatalistic, impulsive, enjoying life while they can- whilst the rich are more future-oriented, self-controlled and cautious. 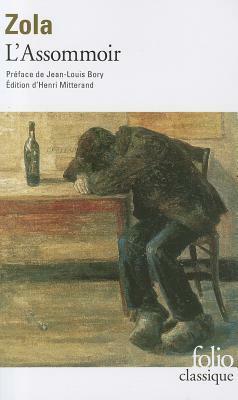 Just read the novels of Zola, for example, for vivid descriptions the appeal of present consumption over savings amongst those with the poorest lot in society. There’s actually a lot of evidence that, statistically, this is more than just a myth. 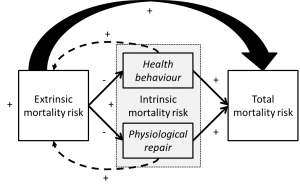 People of lower socioeconomic status-in Britain for example-do tend to discount the future more heavily, are less health-conscious and future oriented. This can lead to a particular discourse about poverty: that people’s poverty is the consequence of their impulsive behaviours, and hence that poverty is in some sense the poor’s fault or failings that leads to their being poor (there would be no other good reason to be poor, right?). 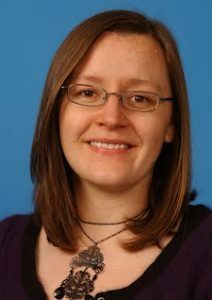 In a n ew paper coming out in the journal Behavioral and Brain Sciences, Gillian presents a different analysis of this phenomenon. What if the relative present-orientation that often goes with poverty were not a failing or weakness (or some kind of primordial character trait), but a sensible response to certain kinds of structural conditions? Imagine a world where you felt that regardless of what efforts you made, you would be likely to be killed or lose everything at a relatively young age. What would you do? Would it make you all the more careful to eat your kale, have your testicular cancer screening and often check the pressure in your car tyres? Probably not. You would probably quite sensibly conclude that there was not much payoff to doing those things since something else would probably get you long before the benefits of those tedious efforts could be realised. You’d try to enjoy the life you could have while you had it. Thus, your present-orientedness, would be an appropriate response to the conditions under which you had to live. That, in essence, is Gillian’s argument. People of lower socioeconomic position in contemporary societies tend to be exposed to worlds where they are in less of a position to realise the returns on future-oriented investments, because more uncontrollable bad shocks happen to them than happen to the rich (and, with growing inequality, a more conditional benefits system, and increased economic precariousness, this is tending to become even more true). If you accept that this is true, then much of their average behaviour, ex hypothesi, makes sense. It’s not a moral failing; you would respond that way too. Of course, it’s not quite that simple, as a perusal of the paper will reveal. 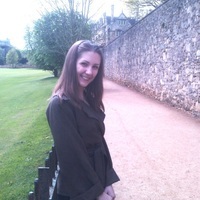 One of the big themes Gillian is interested in in the paper is the idea that the consequences of poverty become progressively embedded via feedback processes. If you start out down one lifestyle path – perhaps for a small but comprehensible reason – the alternative track becomes further and further away and the chance of reaching it, or the point of trying, less and less. This kind of embedding can even become transgenerational, as the behavioural strategies of one generation determine the starting input given to the next. But the big take-home message of the paper is that structural disadvantage is in the explanatory driving seat for the behaviour of the poor. The kinds of interventions, for example for health inequalities, that are of the greatest importance are those that address the structural disadvantages that make poor people likely (whatever they do) to have positive futures they can control and rely on. Behavioral and Brain Sciences is a peer commentary journal, so we are bating our breaths to see what colleagues in the social as well as biological sciences make of it all. One of the issues in this area is that so many disciplines have something to say about social inequality that it is easy to end up (a) relabelling ideas that in fact already exist in other disciplines; or (b) having ideas that are actually a bit different from the received ideas, but are mis-recognised as being something rather different from what you intend them to be. Let’s hope we have steered between that particular Scylla and Charibdis. I am very excited about our imminent production of Matthew Warburton’s Hitting the Wall at Northern Stage on November 30th. In 2012, Wayne Soutter, a middle-aged father of two, attempted to swim the as-yet unconquered sea-channel between the Mull of Kintyre and Ireland. Hitting The Wall is a theatrical recreation of that extraordinary endeavour. Cold seas. Strong winds. Treacherous tides and 50 foot jellyfish. What could possibly go right? Based on blogs and interviews with Wayne and Paul (the boat captain on the attempt), Hitting The Wall asks why we choose to do things that might better be left undone. It’s going to be fun evening, with a chance to discuss the mad endeavour (actually, both mad endeavours, the swim and play about the swim) with the creative team afterwards. I am also equally ecstatic to announce that Straw Bear’s next production after that will be Joe Penhall’s extraordinary Blue/Orange, on March 24th and 25th 2017. 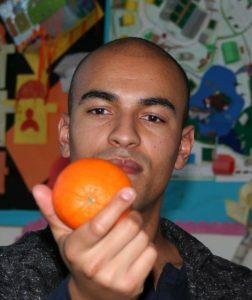 Blue/Orange is about many things, most especially schizophrenia, race and Welsh rarebit, and was described (when it originally appeared in 2000) as the finest new play in the English language for a generation. We are presenting it in association with Brain Awareness Week. The cast has been finalised. More updates soon. The Scottish Graduate School of Social Science has made some interesting short films about the different methods available to social scientists, and in particular, whether they can fruitfully be brought together. 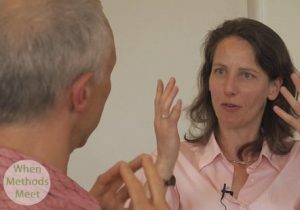 In one of the films, the ethnographer Sam Hillyard and I discussed classic ethnography and experiments; can they be brought together, how are they different, and in what ways are they alike? You can access the film and an associated worksheet here.